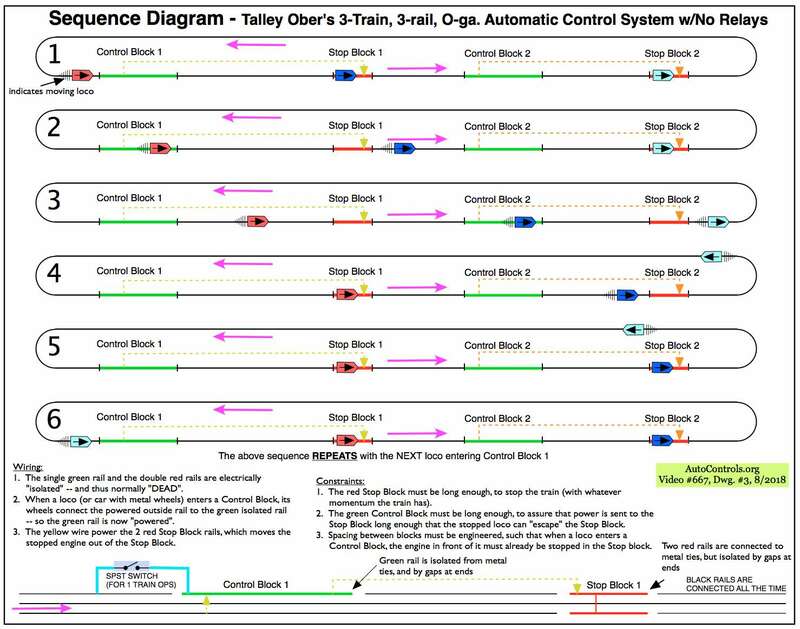 The below images are from the video “aco667: Talley Ober’s 3-train, 3-rail Insulated-Rail O-Gauge Automatic Control System Uses No Relays”. Note there are LINKS to a few RELATED videos & articles at the BOTTOM of this page. Note: CLICK ON any of the below images, to open them LARGER. You can search Youtube for “Talley Ober” and “Eagle Line Railroad” to find additional videos. 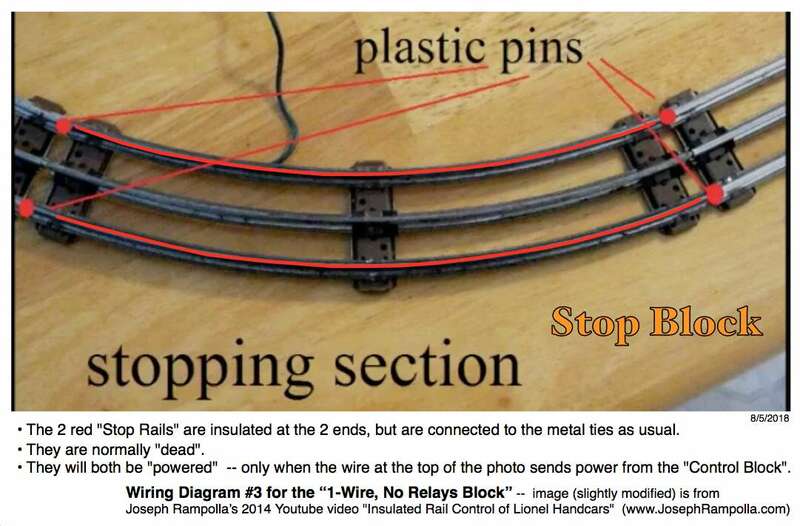 Video: “Insulated Rail Control of Lionel Handcars” (2:26 min). This is Joseph Rampolla’s video, that has the above 3 images. Video: Pine Summit RR: From about 4:40 min. to the 8:15 min. 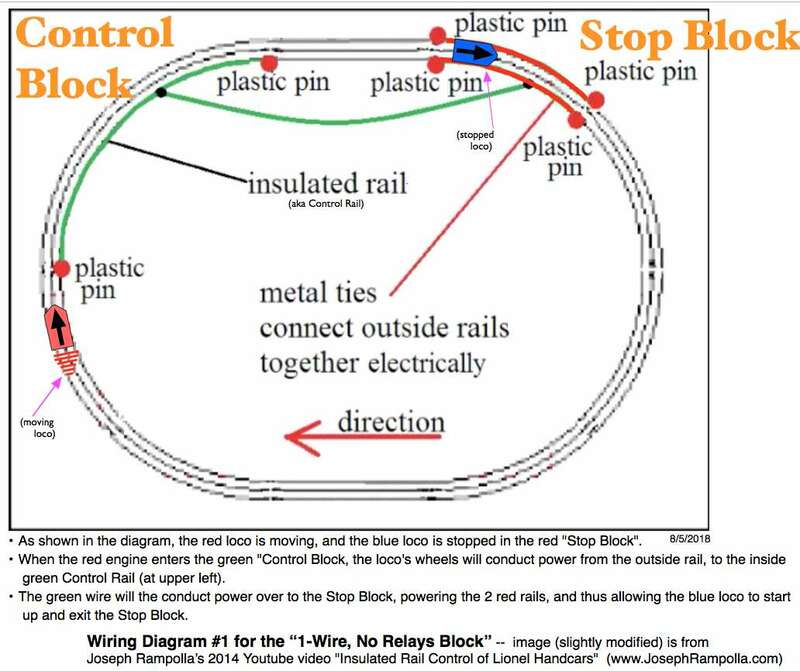 point in the video — the layout owner Rob Mueller, explains how the “1-Wire, No-Relays Block” works for controlling 2 trains on his loop. This link youtu.be/B8BWaO3Y9gA?t=4m35s will start you at 4:35 min point. Video: “Automated Start Stop Block Control” (1:23 min) by Steve Eastman. This shows 2 trolleys, being controlled by the insulated-rail method. Video: “Auto Stop Trolly Layout” (0:34 min) by Steve Eastman. This shows 3 trolleys being controlled. (Note there’s a red, white, & yellow trolley on that loop). 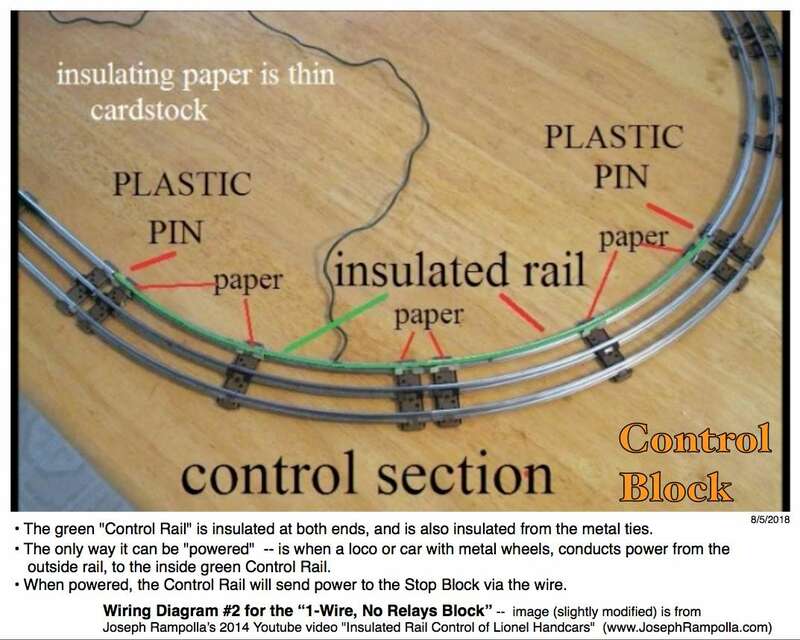 Video: “Block Control.wmv”/”Installing and using blocks on 3-rail model train layouts“(6:08 min) by Lionel. They talk about insulating outside rails, and also about insulating the center rail. 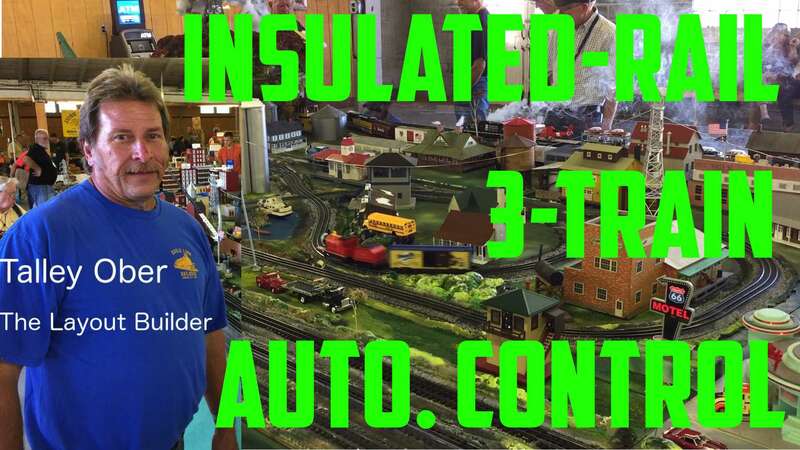 * For our AutoControls Video #667, the center rail is “undisturbed”, so we’re interested in this video only up to about 1:41 where he starts talking about insulating the center rail. Video: Insulated Outside Rail Accessory Activation (9:51 min) by Lionel. View from 0:24 min to 2:47, then from 6:20 to 9:51 (end). You can IGNORE his comments about using an accessory transformer for our purposes, because this would NOT work for controlling a ‘Stop Block’. Video: “Make insulated track sections” (4:49 min) by Classic Toy Trains shows how to convert a piece of normal 3-rail track, to a section with an isolated outside rail. Video: “Make your own Fastrack activation track section” (5:22 min) by Dave Baran. He shows how to isolate an outside rail on a piece of Fastrack. There is an O Gauge RR Forum thread for this video at: ogrforum.ogaugerr.com/topic/youtube-video-talley-ober-s-insulated-rail-3-train-3-rail-o-gauge-automatic-control-system-uses-no-relays-nor-electronics. Video: “homemade signal fun” (2:26 min). This is another Joseph Rampolla video with 2 handcars. Note he is using 2 reed switches and a relay in this video, and NOT the insulated rail method. Joe’s web page at josephrampolla.com/45cross.html has more info on this system. * Note, that this reed switch/relay system gives MORE PRECISE control, but is more wiring than the insulated-rail method. Video: “Marx Block Control Twin Train Sets” (3:48 min) by Steve Eastman. This boxed Marx set has a signal, which probably acts as sort of a relay. Video: “Marx Trains Start Stop Trolley at TTOS SP, 2-22-2015” (0:42 min) by Steve Eastman. I think he’s using that same signal seen in the previous video for control.